Children have been playing with sticks since prehistory. You can pick up, throw, retrieve, bend, break and carve sticks. You can use sticks for digging, poking, building, fighting and creating new tools with. Even animals such as wolf cubs and dogs will throw, retrieve and play tug-of-war with sticks. Many urban parents, however, are worried that playing with sticks will result in injury, especially to the eye. However, just as with climbing trees and crossing streams, the more often you play with sticks and other objects in nature, the more skillful you become at handling them, and the less likely you are to get hurt by them. You learn through experience what is the correct height to lift and throw sticks, and at what distance is someone safe from getting hurt. As a general rule, however, do not lift any sticks higher than your eye level, and never use sticks to strike or poke someone else with, even lightly. Do not fight or engage in battle with your sticks, as someone could get seriously hurt. Do not beat or damage things, e.g. living plants, with your sticks. Choose sticks no longer than the length of your arm. Ensure that the sticks you pick up do not have latex, thorns, parasites, insects, splinters or sharp edges on them. Choose clean-looking sturdy sticks to play with and stop touching the sticks immediately if a rash or any form of allergic reaction occurs. Do not break branches off living plants, but pick up only the sticks you find lying on the ground. Children and parents often feel as if they might get bored quickly if they were to go outdoors without bringing toys and electronic devices along with them. However, there are many games and activities you can carry out with the sticks you find and pick up. These activities can challenge your imagination, creativity, problem-solving skills and engineering skills. 1. Make a two-dimensional drawing in the sand using sticks. Break the sticks into shorter pieces or bend them to create the shapes you want, and press them into the sand so that they will lay flat. Start with simple drawings with straight lines, such as a house, rocket or robot. Now try more complex drawings. Can you draw a dinosaur? How about all the letters of the alphabet? 2. Have a challenge with a friend to build the tallest stick pole using only sticks and twine or rubber bands. At the word "Go", run into the woods and collect all the sticks you can. Tie the sticks together using twine or rubber bands to form the tallest pole possible. The pole has to be able to stand upright with you holding only the bottom stick. 3. Break or cut smaller sticks into equal lengths and use them to play Pick-Up-Sticks. The objective of this game is to pick out and remove sticks from a pile, one by one, without causing the other sticks in the pile to move. This game helps you develop patience, focus, logical thinking skills and a steady hand. 4. Build the biggest teepee or wigwam you can by arranging sticks into a cone shape and tying the ends at the top of the cone together. Depending on the size of your teepee, drape a bandanna, towel or sheet around the cone frame to complete your jungle shelter. Try building more complex shelters once you are good at this. Perhaps a kampung house, or a medieval castle? 5. Have a race to pick up litter along a beach or jungle trail using sticks. How will you pick those plastic bags and picnic cups up? Will you use two sticks like a pair of giant chopsticks? Will you spear rubbish on the end of a sharpened stick? Will you find a stick with a branch or fork in it, and use it to scoop up litter? The first one to successfully pick up 10 pieces of litter and transfer them into a rubbish bag wins the challenge. 6. 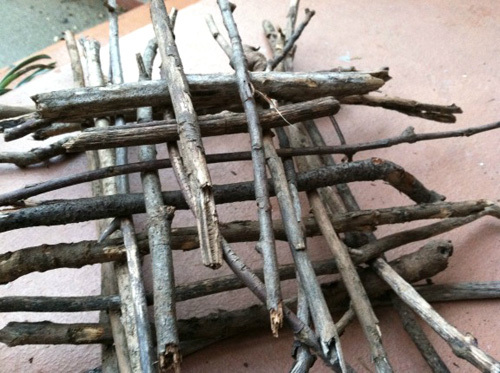 Build a stick tower by layering and stacking sticks, layer by layer. You can turn this into a race and challenge each other to build the tallest tower within a designated time. 7. 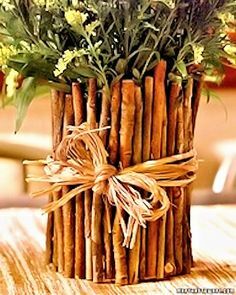 Make a rustic-looking pen caddy or plant pot using a clean, empty steel can and an assortment of sticks. Choose only clean, sturdy sticks without insect holes and fungi and that are not hollow or brittle. Cut the sticks into equal lengths, a little longer than the height of the tin. Use glue or double-sided tape to glue or tape the sticks to the outer wall of the steel can, with the base of the sticks the same level as the base of the steel can so that the steel can will be able to stand upright on a flat surface. Cover the entire outer wall of the steel can so that no steel can be seen. Secure the sticks to the can using rubber bands, and cover the rubber bands using rope or twine. Now you have a rustic-looking pen caddy to hold your items in or even to use as a plant pot. 8. Build rafts using sticks and rubber bands and launch them in a stream. Add a mast and sail if you like. How long will your raft last? Can it bear the weight of a few pebbles on it? Will it flip over, or hold steady? 9. Poke sticks upright into the sand or soil to form a maze. Roll a ping-pong ball through the maze. Your objective is to get the ball out of the maze by blowing at the ball through a cardboard tube. Alternatively, build a goalpost and poke more sticks in the position of a goalkeeper and defenders in front of the goalpost. Your objective is to try to blow or flick the ball into the goal without knocking over the goalie or defenders. 10. 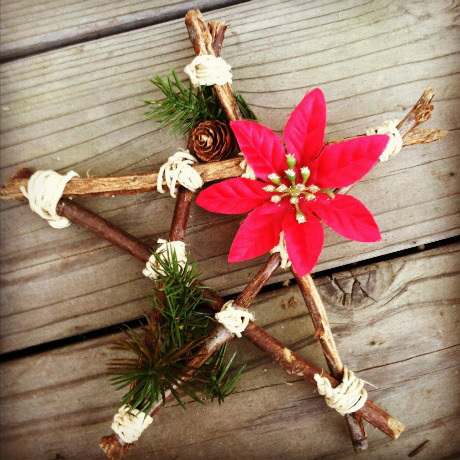 Tie 5 twigs or sticks together using rubber bands or twine to form a 5-sided star.